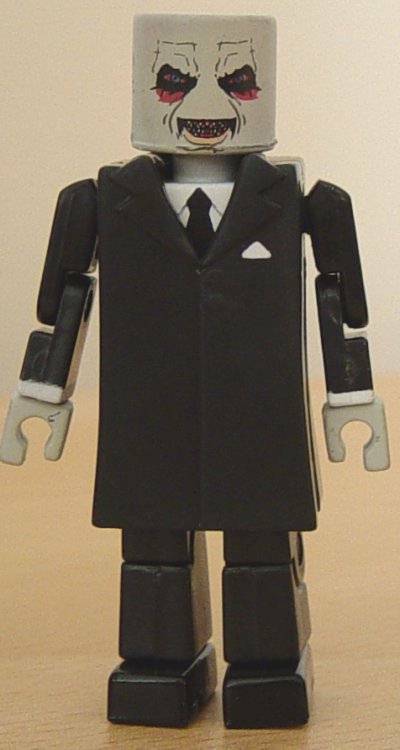 Danny Mills loves his mini-figures. 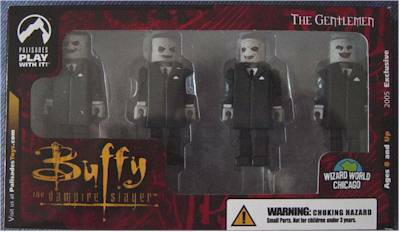 He's back tonight with a great review of the con exclusive Gentlemen four pack from the Buffy Palz series - what's the scoop, Danny! 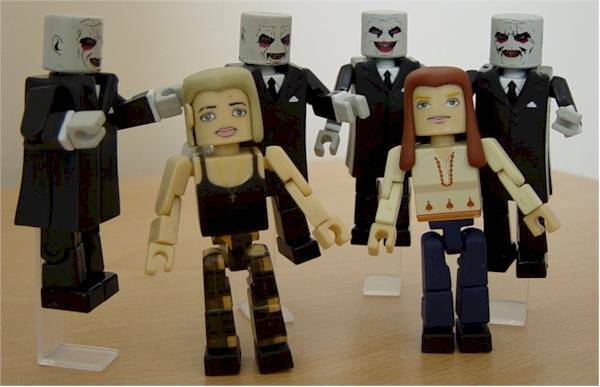 As an avid collector of Minimates - I run Mini-mates Central - I like to keep abreast of what else is hot in the world of block figures, and the Buffy the Vampire Slayer PALz line from Palisades is gaining a real head of steam, with several summer exclusives following on the heels of series 2. The pick of these exclusives debuted at Wizard World Chicago, a 4-pack of the creepy Gentlemen from the award-winning episode "Hush". Pasilades packaging is usually pretty good, and this set is no exception. The front has a large clear window, showing off all 4 Gentlemen, and the back has some very nice text describing who the Gentlemen are and what they do. I always like to see this, as it allows people with only a passing interest in the characters to learn about them. There are no twist-ties to be seen, as with the other Buffy PALz releases, the figures are held in a clear tray, with a second tray fitting over the top to hold them in. It's completely collector friendly, allowing the figures to be held securely in the box but able to be removed quickly when needed without damaging the packaging. Not the strongest category for the PALz figures, because they are based on a blocky body that's designed to be taken apart. In previous waves, there have been some lovely hairpieces sculpted, such as Ghost Willow's hair in the Halloween set, but here, the Gentlemen are bald, so there is little scope for anything really fancy. The suit is sculpted as a removable jacket, complete with lapels. It's very simple, very minimal, but really, not a huge problem because of the nature of the figure itself. Not a great deal of paint on these figures, with the black plastic base being the primary colour. However, the paint on the faces has been done extremely well, each figure getting a different expression with some very subtle colouring. The PALz body allows for a lot of articulation, comparable to Art Asylum's Minimates, with ball-jointed neck, ball-jointed shoulders, elbows, cut wrists, waist swivel, ball-jointed thighs, knees and cut feet. All seems pretty sturdy, too. The one drawback is that the suit, because it fits over the torso block, restricts any lateral neck movement. The Gentlemen only have one accessory each, much less than the usual PALz release, but it's a good one. 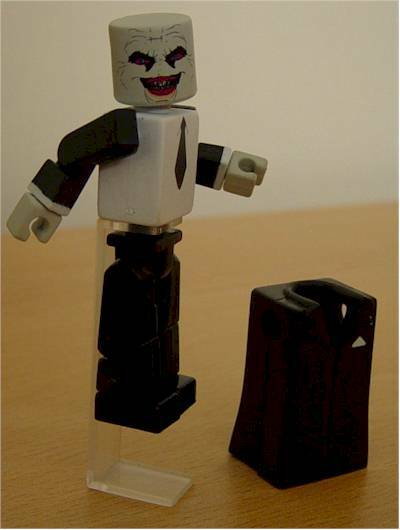 A small clear plastic stand fits around each of their torsos, making the Gentlemen appear as is they are floating. The stand isn't highly noticible because of the way it attaches at the back of the torso, and the long coat hides much of it anyway. It's a very simple yet ingenious way of mimicking their appearance on the show, and works superbly. A small army of undead-looking sinister suited villains? How can these not be fun? 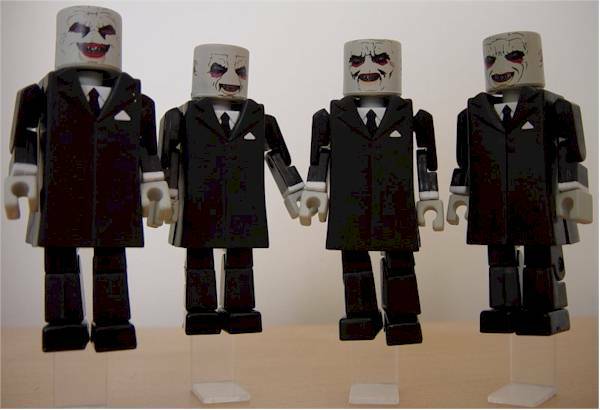 They will make a great addition to any block-figure collection, not just your Buffy or X-Files PALz. 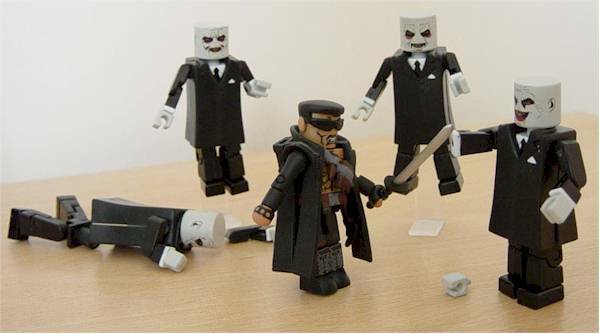 Need some vampiric-looking foes for your Blade Minimate to fight? Here's 4 of 'em, go wild! This is an exclusive set, retailing for $19.99. This seems to be the going rate for a 4-pack block figure set (the summer convention release of the Fantastic Four Minimates set was also $19.99) but I'm sure some will baulk at the price. Compared to the costs of other PALz single-figure sets, I think this price is quite reasonable. Absolutely nothing on my set, but it's always worth having a close squint at your figure's paint apps before you buy, if you can. 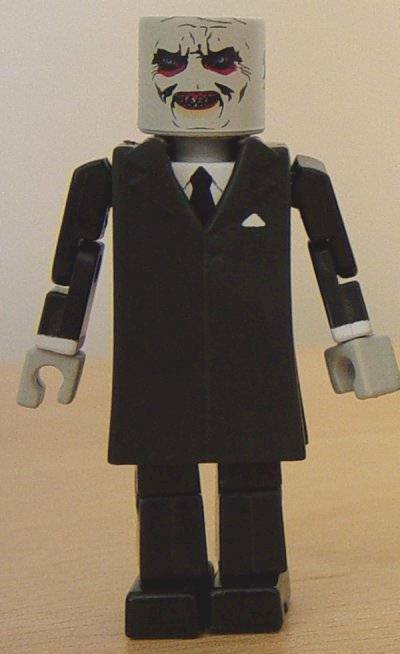 This really is a fantastic exclusive set, fulfilling all the perceived requirements of an exclusive - The Gentlemen are cult characters who would be hard to pack in traditional waves but they are easily tooled due to the repetition of the block figure parts in general and the matching suits in particular. This set loses some of the plus points of the PALz line - lots of accessories and diverse interchangeable parts - but the 4 figures in this set don't lend themselves to either of these strengths. Instead Palisades went for a very strong concept and delivered the figures to match. Put simply, no Buffy PALz collection should be without this gruesome quartet of villains in a line which has so far focused mainly on Buffy's allies rather than her enemies. These were initially available at Wizard World Chicago but have since been sold at the Palisades Collectors Club store. Figure from the collection of Danny Mills.